According to new research by YouGov, while just one in twenty (5%) Brits owned one of the smart speaker devices in Q3 2017, in Q1 2018 ownership has doubled to one in ten (10%). The Smart Speaker study shows that while Amazon remains the main player in the industry its market share is shrinking as new entrants come into the sector. Currently, Amazon smart speakers (which use the ‘Alexa’ digital interface), such as the Echo, make up three quarters (75%) of the market, but this is down from 88%. Close to one in ten (9%) smart speaker owners now have a Google Home Mini, 7% have a Google Home (full size), while 2% have an Apple Home Pod and 1% own a Sonos One. 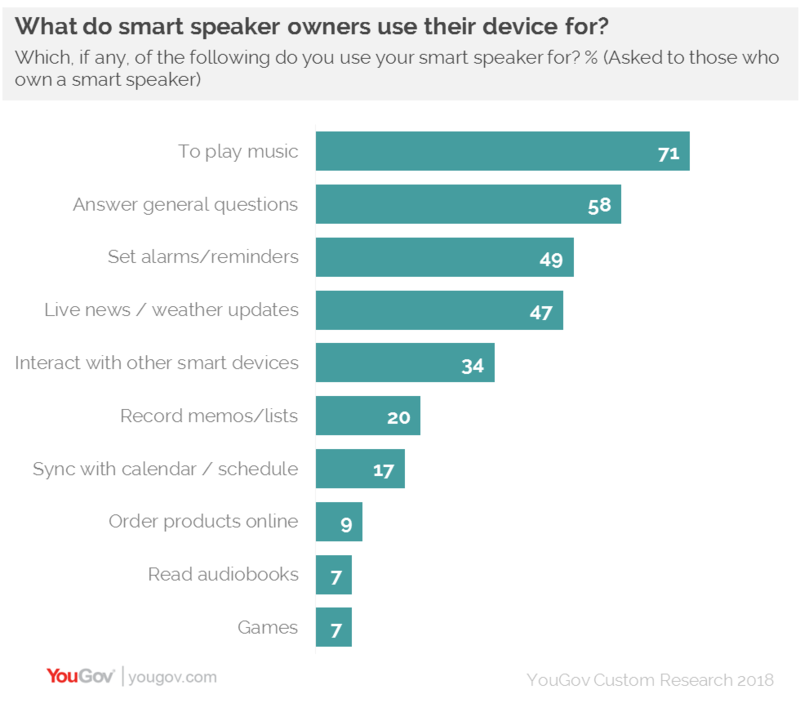 YouGov’s report also analysed how smart speaker owners are using their devices. Seven in ten (71%) say that they use their smart speaker for playing music, nearing six in ten (58%) use it to answer general questions, while just under half use it to set alarms and reminders (49%), or access news or weather forecasts (47%). Notably, over a third (34%) say they interact with other smart devices using their speaker, while nearly a quarter (26%) said they bought their smart speaker specifically because it can integrate with other devices. However, the study finds that there is not an overwhelming demand from the public for smart speaker, with just 5% of the UK population being in the market for one. Although, among those who are looking to buy a device, four in ten (41%) expect to get it within the next six months. The research shows that older people are more likely to have a smart speaker. A third of owners (33%) are aged 55 and over, while 23% are in the 45-54 age group. Only 10% are aged 18-24. While Amazon has lost smart speaker market share in the past six months, ownership of its devices continues to grow and it remains the dominant player in the industry. However, because demand among the public for a smart speaker is only modest, the brands that stand to gain most are likely to be ones who can either bundle ownership up with other services or can demonstrate how useful devices can be when it comes to accessing information, goods and services. From both standpoints, Amazon is well placed. As more people adopt connected domestic devices, the usefulness of a connected speaker – which integrates with other area of a connected home – will become greater. While we are not yet at a critical mass for ownership, when we are, brands will have a great opportunity to market their products more effectively.